Transitional spaces between rooms can be tricky to furnish. Often times the furniture needs to serve dual purpose and have the ability to suit the aesthetics of both connecting rooms. I have such a space between our kitchen and dining area and found this French Display Cabinet from Kathy Kuo Home fit perfectly. I love that it will allow me a space to serve drinks, desserts, or appetizers during parties and also have fun with seasonal vignettes and decor. 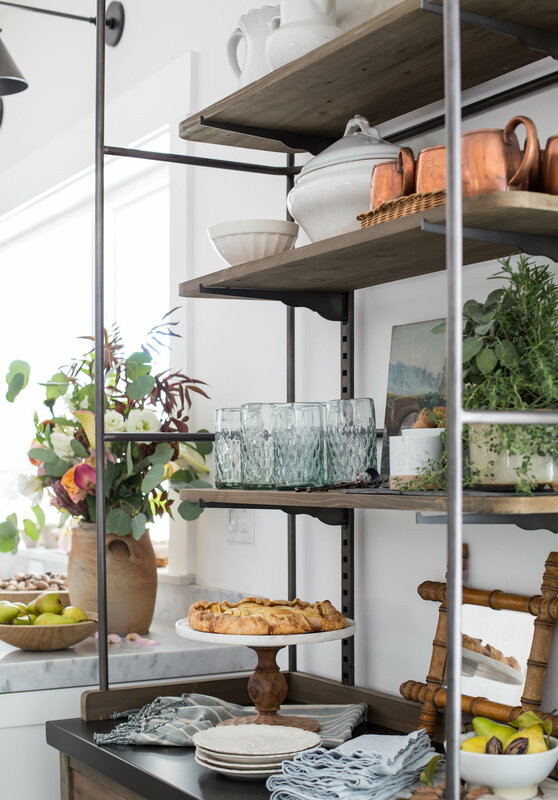 The shelves are adjustable making it easy to accommodate large platters, soup tureens or wine and champagne bottles when entertaining. It also came with iron hooks to place on the rails but I haven't found a use for them yet. Maybe for a tea towel when serving drinks or as mug hooks? Who knows, they might come in handy sometime. One of my favorite things about the piece are all the small drawers below. I've got them loaded up with votive candles, matches, napkins, serving utensils, wine openers, etc., etc. For now I added pieces I had on hand and a few from a recent antiquing trip to Santa Barbara that had an autumnal feel to them....vintage copper mugs, ironstone, an antique French painting. And I mixed in a bit of the colored glass I have in other areas of the kitchen to tie them together. I'm looking forward to adding fresh evergreens and holiday elements for Christmas! I baked an apple tart yesterday for this post and still have enough pastry dough to make another one. I'm thinking it should definitely include pecans since we were gifted a giant bag...just in time for Thanksgiving. Off to search for a recipe! Or maybe you have a favorite? Sources: French Display Cabinet - Kathy Kuo Home, Recycled Glass Tumblers, Washed Linen Napkins, Similar Marble & Wood Cake Stand (the one I bought from Anthropologie is sold out) and Marble Candle Holder. All other items are vintage or antique finds...my favorite way to shop! Between posts you can find me on Instagram sharing highlights of daily life.